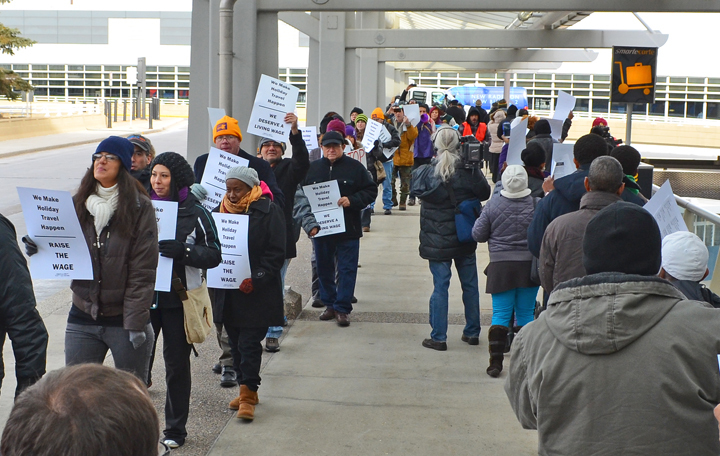 Airport workers and their supporters marched outside Terminal 1 at Minneapolis-St. Paul International Airport, where organizing efforts have focused on raising wages. Low-wage workers at Minneapolis-St. Paul International Airport now have a voice on the airport’s governing body, thanks to Minnesota Gov. Mark Dayton. Last week Dayton filled two vacancies on the Metropolitan Airports Commission, which owns MSP and six smaller airports in the Metro. One of Dayton’s appointees, Ibrahim Mohamed, works as a cart driver for AirServ, a subcontractor that handles passenger services for Delta Air Lines. He earns the state’s minimum wage, $8 per hour. Mohamed, a Rosemount resident who has worked at MSP Airport for 11 years, is the first Somali-American to serve on the MAC. Dayton’ other appointee, Dixie Hoard, is a former Northwest and Delta flight attendant from Thief River Falls. Hoard and Mohamed will participate in their first MAC meeting tomorrow. Mohamed has been active in efforts to improve AirServ workers’ wages and working conditions by organizing a union, a campaign supported by Local 26 of the Service Employees International Union. SEIU Local 26 announced Mohamed’s appointment in a press release today. “I am excited to bring the voices of the people that I speak to on a daily basis to the MAC,” Mohamed said via the press release. “In my current position as a cart driver, I speak with hundreds of elderly and disabled passengers each day. I hear about their time in MSP and am the first line of response to help. In addition to working as a cart driver, Mohamed has served as a baggage runner, ticket verifier and in lavatory and water services. His range of experience, he said, will allow him to serve the residents of his district and be a voice for the workers on the front lines. MSP Airport has been a hotbed of organizing activity in recent months. SEIU Local 26’s organizing campaign is operating in concert with a campaign to raise the airport’s minimum wage to $15 per hour. And more than 20,000 flight attendants at Delta, which uses MSP as a hub for its operations, are poised to vote soon on whether to join the International Association of Machinists. Local 26 President Javier Morillo said Mohamed will be a strong advocate for workers in his new role.